Founded on April 16, 1912 in Split and named "Anarh" in Plinarska street in Veli Varos - in the house at number 7. Officially managed to register the on July 25, 1912. Only the name of the club says the presence of the ideas of anarchism among the poor population - workers and peasants, especially in the former advanced youth. The first prohibition action came after the Sarajevo assassination of Franz Ferdinand , in the wake of the First World War. The club refused to hoist a flag with a black band, which was enough for the authorities to do what they are constantly threatened - disbanded the club. The new authorities in Split are not looked favorably effect them obnoxious club , and already in April 1919 prohibited work. After the ban, the Assembly held in the club June 1919, which chooses a new name for the club - JNSK Jug. The new club officially started operating in early December 1919. Jug come under the wing of Slavia, and then merged with a small student club split. Neither the club not long exist.Playground is open for Labor Day in 1926 followed by the new ban - in October 1928. In the spring in 1929 former members of the new club Borac access - Split HAŠK in. Name of the Croatian amateur sports club is particularly bothered to police. The first meeting of the club under the new name was held on September 21, in 1930. In Cafe Zora in Krešimirova Street. 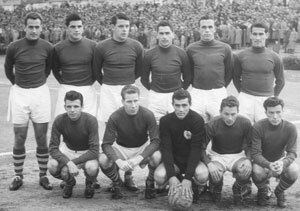 Team split a few years later - 1933rd won the qualifying entry into the then Kingdom of Yugoslavia, the National League (Premier League). League that year is reduced, so the split had to play extra qualifications. He failed to gain entry to the First Division for the season 1933./34. - What is a toy and morally already been won. New club facilities were opened in 1937. The in-house Rožić in Zoranićeva street. In qualifying for the first league in the 1937-38 season. The Reds defeated Slavia from Varazdin. After the war an initiative to rebuild the football club in Split has been launched. Meeting of the Preparatory Committee was held on 17 August 1945 in the woods tobacconist's in the Marmont Street. In the competition between the 1953 up in 1957. Split from local leagues for only five years came to an elite class - the first national league. In 1953 were the champions in the Football Championship Split sub-federations. As champions of Dalmatia achieve placement in the Croatian-Slovenian league, where 1953./54. occupy fifth place, and 1954./55. entering into another league. In the second division 1955-56. were fourth, and the following year 1956./57. won first place with six points ahead of Sibenik. First place brought them the opportunity to achieve qualification through placement in major league Society. The qualifications were second, placing them in a season 1957./1958., Makes first appearance in the First Federal League. n the 1992-93 season . Split again struggled to enter the First Division . In the battle between Split, Solin and NK Primorac , a new first league became Primorac from Stobreč . In the next three seasons , from 1993-94 . until 1995-96 . Split achieved mediocre placements . In 1996-97 were champions of the second League - South. Abolition 1B League the same year stay in Split second Division - South. A new opportunity for entry into the First Division had Splitovci 1997-98, but the qualifications are not passed . New competition system 1998-99 . brings a unique second division in which the " Split " took fifth place. A year later , in the 1999-2000 season . there is a large accumulation of debts that lead to a situation where bankruptcy is conducted NK Split . The club is at the end of the season was the 15th place and knocked out other leagues , and then the third leagues . In the 2006-07 season . Red were not without chances of ranking higher in ranking events . They finished in second place behind Neretvanca from Opuzena . In the 2007-08 season . Split won the championship fourth Division - South, Subgroup A , and thus achieved a placement in the third Division - South. In the first " comeback " season in third Division - South , the club won first place in the standings and second HNL.U season 2009./2010 . RNK Split overwhelmed 2.HNL from season 2010-2011 . 1.HNL appearances . At the end of the 2010-2011 season ranked third place in 1.HNL , and thus achieved the first-ever participation in the Europa League.